This has been the toughest week so far for Theresa May’s premiership. She lost two of her most senior ministers, Foreign Secretary Boris Johnson and Brexit Secretary David Davis, because of irreconcilable differences over Brexit. And her week got tougher with the much-awaited visit of the US President Donald Trump. The UK is in “turmoil” and “it is up to the people” whether Theresa May stays as prime minister, Donald Trump said ahead of the visit. Mr Trump told reporters before leaving Washington for a NATO summit in Brussels that there were “a lot of things going on” in the UK at the moment. He said he got on well with May and had “always liked” Boris Johnson, who quit as foreign secretary Monday. Donald Trump arrives to the UK Thursday. May’s original plan was to invite Trump for a high-profile visit where he was to lend his support to the UK after Brexit, promising a fast-track, generous free trade deal with the UK. According to the US president’s itinerary, he is going to travel straight from the NATO summit in Brussels to Blenheim Palace in Oxfordshire, where May will host him and his wife Melania for a black-tie dinner with 100 guests and ministers Friday. Guests at the dinner will include representatives from the UK’s financial services, the travel industry, creative industry, food and drink sector, engineering, technology, pharmacy and defense sectors. Then, Trump and the First Lady will travel to Winfield House, the US ambassador’s residence in Regent’s Park, where he is able to land by helicopter, avoiding central London where tens of thousands of protesters are expected to demonstrate against him through Oxford Circus and down Regent Street before ending in Trafalgar Square, while a giant inflatable Trump, depicted as a baby, will fly above London during his visit. Trump will next travel to the prime minister’s country home, Chequers, for bilateral talks on a range of foreign policy, issues including trade. He will then travel to Windsor Castle to meet the Queen. From Friday evening the president and First Lady will travel to Scotland where they will spend the rest of their trip before Trump departs Sunday evening. However, Trump’s carefully choreographed visit could not have come at a worse time for May. Internal fighting in her government between the moderate wing in the Conservative Party, who seek a business-friendly soft Brexit, and hardliners who want a hard Brexit, is not going to go down well with Trump who once described himself as a proud Brexiteer. According to May’s soft Brexit plan, there will be a “common rulebook”, meaning the UK will “maintain a common rulebook for all goods” with the EU, including agricultural products, after Brexit. A treaty will be signed committing the UK to “continued harmonisation” with EU rules and laws, avoiding friction at the UK-EU border, including Northern Ireland. Parliament will oversee the UK’s trade policy and have the ability to “choose” to diverge from the EU rules, “recognising that this would have consequences”. “Cooperative arrangements” will be established between EU and UK competition regulators. “Different arrangements” will be organised for services “where it is in our interests to have regulatory flexibility”. Also, a “joint institutional framework” will be established to interpret UK-EU agreements. This would be done in the UK by UK courts, and in the EU by EU courts. But, decisions by UK courts would involve “due regard paid to EU case law in areas where the UK continued to apply a common rulebook”. Cases will still be referred to the European Court of Justice (ECJ) as the interpreter of EU rules, but it “cannot resolve disputes between the two”. Borders between the UK and EU will be treated as a “combined customs territory”. The UK would apply domestic tariffs and trade policies for goods intended for the UK, but charge EU tariffs and their equivalents for goods that will end up heading into the EU. Also, a “mobility framework” will be set up to allow UK and EU citizens to travel to each other’s territories and apply for study and work. The US president will not fail to notice that May chose to side with the soft Brexit wing, upsetting prominent figures in the Brexit camp close to the US president. Nigel Farage, the most prominent leader of the Leave campaign and a friend of the US president, called for May to resign after the disarray in her government. For a president who considers his victory in the US presidential elections and Brexit a fightback against elitism and the establishment, giving May unconditional support for her vision of a soft Brexit is hard to imagine. He is not a friend of the EU. Last week, Trump accused the EU of going after the United States’ “piggybank” amid an ongoing trade dispute over tariffs. His comment comes amid a continued escalation with the EU over the trade war, NATO’s budget, North Korea policy, the Iranian nuclear deal and the relationship with Russia. “The United States is spending far more on NATO than any other country. This is not fair, nor is it acceptable,” Trump tweeted Monday, insisting that NATO benefits Europe “far more than it does the US”. European officials are worried that the US president’s emerging doctrine, which is “no friends and no enemies”, is dangerous for Europe. The US president’s resentment of the EU went as far as suggesting to French President Emmanuel Macron, during a private meeting when Macron visited the White House at the end of April to pull France out of the European Union in return for a bilateral trade deal. Trump has been trashing the EU and NATO since his electoral campaign, two organisations Prime Minister May works closely with. Brexit is not the only potential flashpoint during the visit, the relationship with Russia is another. London, with the rest of the EU countries, is worried about Trump’s potential embrace of Russia’s Vladimir Putin during a summit in Helsinki next week. So, Trump is May’s “guest from hell”. After the false promise that they might get on well, when they met in Washington two years ago, the relationship deteriorated rapidly over criticism in London over his immigration policy, the US travel ban on Muslim majority countries, Washington’s Iran policy, climate change and the suggestion from the White House that Nigel Farage should be appointed as the UK ambassador to Washington, which did not go down well in London. But the real damage in their relationship happened after the terrorist attack in London in June 2017 when Trump used the attack to criticise the mayor of London, Sadiq Khan, who fiercely disagreed with Trump’s immigration policy. May intervened to defend Khan, emphasising that it was “wrong” to suggest London’s mayor was not doing a good job. 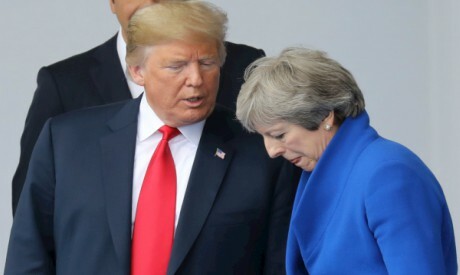 And with May’s failure to give Trump the State Visit he dreamed of, because of public outrage against him, it is difficult to see the so-called “special relationship” bouncing back.